The web application firewall is a good feature, despite it limiting you to only using ports 80 and 443. The web application firewall and web filtering. We are using the UTM to be the gateway for the private cloud solutions we offer. Easy management of the firewall, with one URL to control the firewall/web filters for our entire cloud. HA needs to be improved for the software appliance because if Sophos is deployed in ESXI/Hyper-V then the HA is unstable. Also, the web application firewall only allows the use of ports 80 and 443, and if we could use others ports than that would be a welcome addition. For two years now in our datacenter, and also several deployments at some of our customers. Setting up the link aggregation group (NIC teaming) gave us some problems with the ethernet VLAN option for WAN, but after a firmware update, the issue was resolved. If you enable the intrusion prevention option in the firewall any Wordpress deployments on a Plesk server behind the firewall slows down to a crawl, and there is no fix yet. The current workaround is disabling the intrusion prevention option at the moment. 7/10. Getting a new license for the SG220 sometimes takes a long time, but they will give you a 30 day demo license to compensate for it. 9/10. Any question or issue is solved within minutes after calling technical support. SonicWALL was our previous product, and we switched to Sophos because of its ease of use. When you start the initial setup you`re helped with wizards, but if you use the software appliance and make a mistake by selection wrong interfaces in the wizard it can result in the firewall becoming unreachable.nThe hardware appliance is (almost) plug & play. It's around six to nine months. We looked at several open-source firewall options whose names I will not mention, and the reason we did not use them was because of the ease of use, and what our support desk could do. 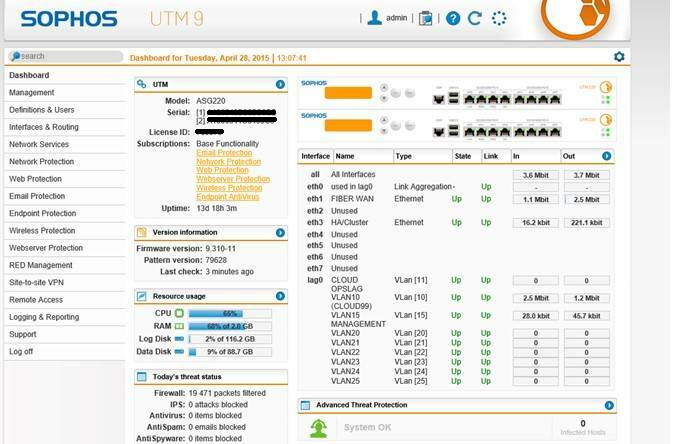 If you want an easy to manage, and powerful firewall then take look at Sophos UTM. Disclosure: My company has a business relationship with this vendor other than being a customer: We are a reseller of the Sophos UTM and or other product of Sophos. Start your 30-day free trial today with Sophos UTM! Download our free Firewalls Report and find out what your peers are saying about Sophos, Fortinet, pfSense, and more!